Shelby Allison co-owns Lost Lake, a tropical cocktail bar in Chicago that opened in 2015 and was named Best American Cocktail Bar at Tales of the Cocktail’s 2018 Spirited Awards, is a three- time James Beard Foundation semi finalist for Outstanding Bar Program (2016, 2017, 2018), and one of the World’s 50 Best Bars (2018). Shelby is a co-founder of #SHIFTEASE, a monthly charitable party at Lost Lake that supports local Chicago organizations working for progressive racial, economic and gender justice, and is a founding board member of the Chicago Period Project, an aspiring non-profit that helps Chicago’s homeless and in-need people experience their periods with dignity. Shelby was one of Chicago Woman’s 10 Most Influential Women in Chicago’s food and beverage community (2018), and one of Wine Enthusiast’s 40 Under 40 Tastemakers (2018). Caitlin is a beverage and bar consultant living with her wife in Chicago. She was previously the beverage director of Ace Hotel in Chicago and before that helmed the much-lauded Mission District bar Trick Dog. There, she led the bar to an incredible list of accolades including Tales of the Cocktail’s Best Bar Team (2014) and Bar Fight Champion (2014), a James Beard finalist nomination for Outstanding Bar Program (2015) and two consecutive years on Drinks International “World’s 50 Best Bars” list. She was named Food & Wine’s Best New Mixologist (2014) and National Speed Rack Champion (2014). She has also consulted for notable programs such as Mexico City’s Limantour Roma (Drinks International “World’s 50 Best Bars” list #11, 2018) where she helped launch a new menu. 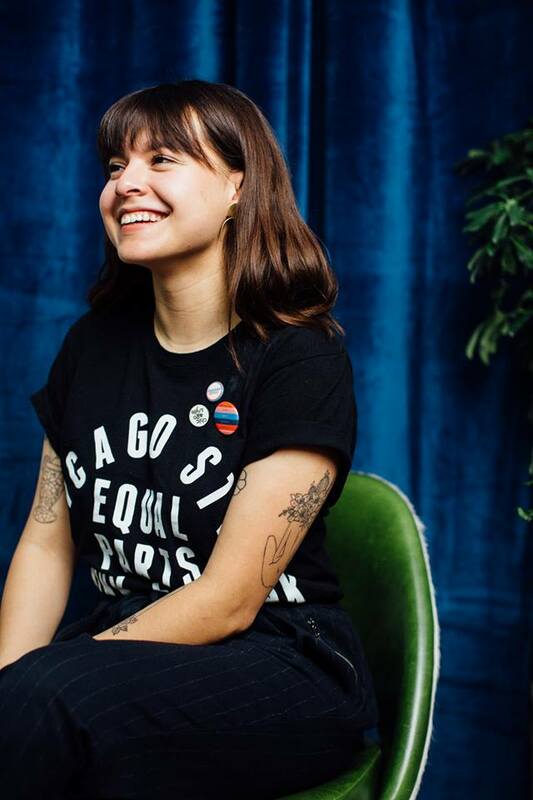 Caitlin is currently creating a training and mentorship program for queer youth in Chicago looking to break into the world of cocktail bars. Christopher Walker is a black genderqueer transmasculine boi raised in the lily-white suburban hills of New Jersey. They are a freelance event producer and social media consultant who holds a BS in Management and Business from Skidmore College in New York. They currently hold the title of Social Media Manager for Open Television, a web series platform and artist incubator that prioritizes creators that are queer, women, femme-identified and people of color. Chris is also an Associate Producer for People Who Care, a marketing consultancy for non-profits. Chloe started her design career in publishing, but fell hard for the hospitality world after years of pursuing the best restaurant experiences the industry had to offer. A self proclaimed “food-obsessed designer,” she does her best work when working with brands and people she’s excited about–especially when there’s food involved. When off the clock, you can find her devouring cookbooks, trying to slow down at yoga or planning her next eating-focused adventure. As Vice President of Marketing for Fords Gin, Chicago native Sharon Bronstein brings Fords Gin and its sister brands to life for professional and novice bartenders alike, while supporting and celebrating the bartending community. Sharon works hand-in-hand with the company’s sales and advocacy teams to oversee national and local initiatives, including Bar Fight Club, the Trash Tiki Anti-Waste North American Tour, and the debut of Fords Gin Officers’ Reserve in February 2019. Sharon is also a co-founder of the Sisterhood Project, a platform that offers empowerment and mentorship to the bartending community in partnership with Speed Rack. Currently in its third year, the Sisterhood Project hosts educational events focused on key issues for hospitality professionals. Bronstein was named to the “Dame Hall of Fame” at Tales of the Cocktail in 2017. From a young age, Jenna found herself drawn to the chaos of the kitchen, but quickly found she was better suited to stay out. As such, a career in marketing and communications was born. She is the co-founder of Slow Down Co., a marketing and communications agency that provides marketing direction to food & beverage, lifestyle and hospitality brands. When not talking about food, Jenna enjoys drinking mezcal, urban hiking and connecting people.